Lately I’m finding it very difficult to write about cancer stuff. I sit down at my computer, almost every day, feeling inspired to write a blog post or work on this “book” that I haven’t touched or really thought about in a long time. And then quickly, the motivation goes right out the door. I put on another episode of Scandal and instantly forget about whatever it was that I felt I needed to get down on paper (and by “paper” I mean “computer”… but that obviously sounds way less romantic and writer-ish). I’m not sure why this has been happening, but I think much of it is due to the fact that I am majorly cancer’d out. I have not had one day where I haven’t had to think or speak about cancer in a very long time. It is exhausting thinking and talking about such heavy things all the time. I keep trying to have a day where I don’t think about cancer once the entire day, but I have not come close to succeeding. People say that eventually the day comes where you realize, “Hey, I haven’t thought about cancer in a week!” Honestly, I can’t imagine that really happening. I might think about it less on certain days than others, but the idea of it being entirely absent from my thoughts just seems impossible right now. It is such a major part of my life. I didn’t invite it in, but there it is, and its presence is constant. Cancer is not just something I had, or something that is in the past. It has become a huge part of my life. I used to get emails from people asking me for movie or music recommendations. Now I get emails asking for advice about getting through chemo and radiation. This has become my new area of expertise. When people have a friend who is diagnosed, they send them to me. The cancer guru. The Dear Abby of planet cancer. And really, I’m okay with it. I love helping people, however I can. I like reading about clinical trials and drug advancements and understanding a very complex world that until recently, I knew very little about. I am a passionate person and I become highly invested in whatever it is I am currently working on or learning about. And, as unfortunate as it may be, my “job” and my “work” has been cancer for over a year now. I am drawn to books and movies about cancer. I like talking to people about their own experiences with cancer. I suppose, like anyone, I want to feel like I belong. And as much as I want to just be a “normal” young woman, thinking about things like work, and social events, and all that regular-people stuff… that is not my life. It is part of my life, sure. But so is cancer. There it is, and there it will always be. But all that to say that sometimes, I just need a break. Sometimes I am literally so tired from thinking about it and writing about it, living and breathing it, that I need to lie down and take a nap. Sometimes I just need to turn my brain off, from the research, the statistics, the drugs, the fear, and the reality. Sometimes I just need to turn on the TV and watch The Bachelor, which is pretty much the opposite of thinking about cancer. So that’s what I’m going to do. I’m going to watch The Bachelor premiere (and you should too, so we can talk about it) and I’m going to give myself a whole hour, free from cancer, free from the heavy stuff. You might need a break from your screaming baby. Or your beeping Blackberry. Or your cancer. Whatever it is… sometimes, we all just need a little break. 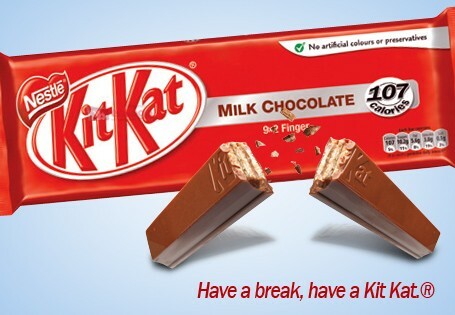 Oh lordy, now I really wish I had a Kit Kat. OMG! I loved this post! I am feeling the exact same way. I feel so bored with the whole thing but at times I still want to help others. I didn’t post on my blog for almost a month but have about 10 drafts started and know I will never finish them. Instead of writing I became a Dowton Abbey season1,2,3 crack addict! I have no desire to clean the house, put away Christmas decorations or fix a creative dinner. I finally came up for air and set a goal to do a half marathon in four months. I went to the gym, ran the treadmill, felt really good until I got a biopsy back that says my cancer has spread. Back to the couch and the cast of Downton Abbey:( So tired of ‘Cancer Limbo’. I took a good long break in talking about cancer to non-cancer people most of the time (nothing in my blog, little posted online) and only realized just how much radio silence there had been until I was out with a friend )not a close friend, mind you, but a friend) who didn’t realize I was on chemo. But these breaks are needed, however imposed, because you can’t really turn your brain off so you just have to kind of force it to be quiet sometimes. I understand, I really do. Being burnt out on a subject but being unable to escape it sounds pretty awful. I would give yourself a mental break from it as much as you can – maybe one or two days a week where you don’t allow yourself to do anything related to cancer (of course you will probably still think about it, but maybe restrict yourself from reading, writing, or talking about it?). It’s easy to become almost obsessive about something so stressful and consuming (has definitely happened to me, anyway), but you might find it therapeutic to give yourself forced breaks? Wow that was beautiful. It made me cry. I find myself thinking about it too all the time and I’ve never had it. If I have a weird pain or find a weird bump I’m like OMG it’s cancer. But you do deserve to not think about it. And I am as well not gonna. As soon as it enters my mind I’m going to kick it out. great season of brain fluff Bachelor fun!! While not nearly of your magnitude, 2013 was a very difficult year for me personally as well, and I absolutely found that a hiatus of thought from some things was a necessity. You’ve proven that you are not comfortable ignoring reality. A thought vacation is an entirely different – and I feel necessary – thing. Downton Abbey premier. Nearly forgot about my implants. Yes! I have already seen this season or I would have been watching. We need to allow us to change the focus of our attention. None of us has a guarantee of tomorrow. All we have is now, the fraction of the second that allows us to feel. Living is risky for anyone, but we can make beautiful flights if we give our souls wings. I love ktkat!